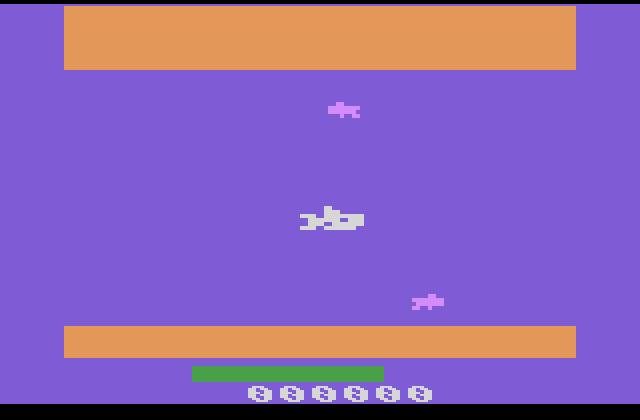 Hunger Shark for the Atari 2600. 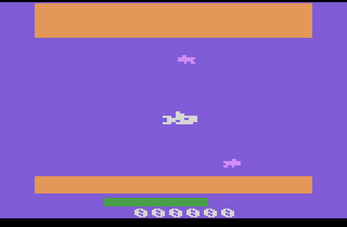 Rom can be played in an Atari 2600 Emulator, such as Stella, or on Real Atari 2600 and 7800 systems if you have the means to put it on a cartridge. This game is free, as will all of my future Atari 2600 games, but a small donation is appreciated and helps me to create more Atari 2600 games. Eat people to avoid starvation, but watch out for that pesky Coast Guard! This game is still being developed. Updates will resume upon a certain amount of plays. In Hunger Shark you play as a shark with an insatiable appetite. - To move Hunger Shark, point the joystick in the direction you want him to move. - To eat people, Hunger Shark must sufficiently overlap them. Doing so gains you points, and replenishes a bit of your Hunger Bar. - If your Hunger Bar drains completely, you will die of starvation. - After some time, when the water becomes blood red, the Coast Guard will send a patrol ship and shoot at you. - Touching a squid collects it for later use. Using a squid, by pressing fire, will replenish your health completely, but will spray ink, thus turning Hunger Shark and the water black for a time. You can carry up to three squids at a time, but touching them will always yield 1000 bonus points. - Treasure is known to pop at the sea floor from time to time. It may not be nutritious, but it does yield 1000 bonus points. - Mines will periodically spawn near the bottom of the screen, so be on your guard! - The game increases in difficulty slightly with each level.